Look what arrived at the weekend! 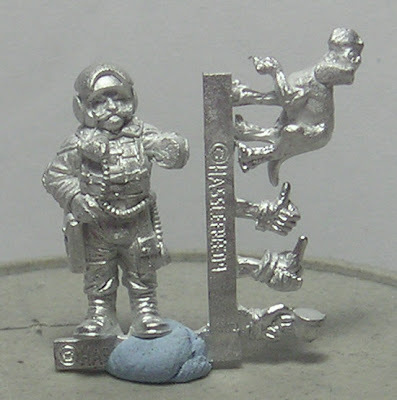 The Grymn Air Force FlyER (or GAFFER as I am calling him) is the soon to be released Grymn Pilot figure from Hasslefree miniatures. My enormous thanks to Sally, Kev and Kate of Hasslefree for sending me this present ahead of its release date. It is also the last remaining figure I needed for my 2009 Diorama of Doom entry. Now i have no excuse not to finish this project ahead of the 31st October Deadline. Now i'm not normally a starwars fan, but I can't help looking at this figures flight suit and thinking - Ooh! that would look smart in orange!